DC restaurant-goers are scurrying around the city right now, trying to keep up with openings and pop-ups. It’s not an easy feat. It requires patience, fortitude, and often a tolerance for the highest level on the decibel meter. 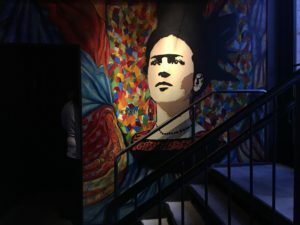 A visit to Espita Mezcaleria in Shaw is a test on all three counts. But the payoff is well worth it. 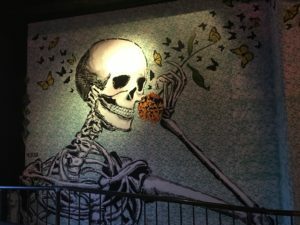 It is essential to bring an adventurous spirit to Espita Mezcaleria, where there is a focus on mezcal, an agave-based spirit originating in Oaxaca, Mexico. Owners Josh and Kelly Phillips are experts in mezcal, and Josh is a Certified Master Mezcalier. Yes, this is a thing. There is a mind-boggling list of more than 90 varieties of mezcal, available in intriguing flights, single pours, or blended in cocktails. Need help distilling it down? The staff is eager to help. Assistant Manager Ace Karchem is our able spirit guide. Salsa and chips is the way to start here, with seven salsa options from which to choose. Heirloom corn is sourced daily from Mexico and ground into masa for chips and tortillas. If you want to infuse mezcal thoroughly into your meal, try the kicked-up borracha salsa with mezcal, orange, and chipotle chiles. I’m thankful to be in a group of six, giving us the bandwidth to sample at least one item from each section of the alluring menu from Executive Chef Alexis Samayoa. My companions wait patiently as I take the lead, mulling over options in categories of ceviches, mole, fundido, ensaladas, tacos, and more. 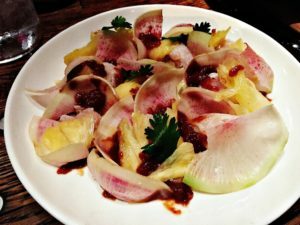 Mexican food is not always about looking pretty, but there’s plenty of visual interest here, including hamachi ceviche with pineapple, watermelon radish, and sangrita granite. 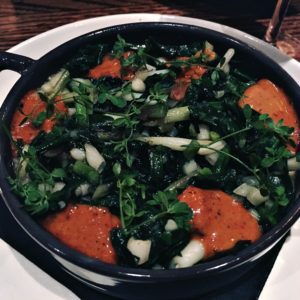 Fundido is a rich and gooey concoction melding chihuahua cheese – and on our visit- seasonal ramps and peas. Chips serve as the utensil, and its easy to settle in to this filling dish. Resist the temptation, as you need to save room for more Mexican sensations. 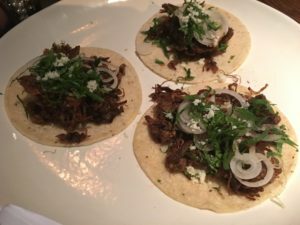 There are eight kinds of tacos, including maitake mushroom with salsa and pickled white onion as well as lamb barbacoa with tomatillo, cilantro, and queso fresco. Pescatarians can satisfy their taco needs with fillings of grilled tilapia or crunchy mini Silverside fish, tarted up with lime mayo. The list of moles is nearly as long as the tacos, and it is here that I find decisions the most challenging. 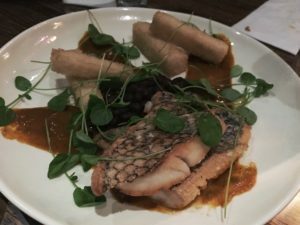 Amarillo mole combines striped bass, chiles, tomatatillo and masa with the mole serving as a quiet accent. 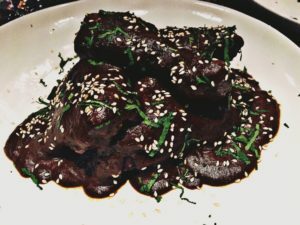 Manchamanteles is a half chicken thickly coated with an irresistible dark, rich, sweet mole made incorporating roasted tomato, apples, banana, and chiles. Smoked eggplant with salsa borracha salsa is a fitting topping for crispy fried sopes, benefiting from freshly ground masa. 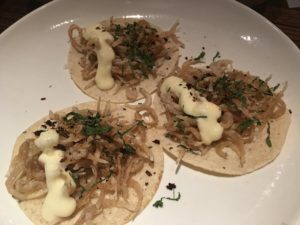 Don’t go to Espita Mezcaleria if conversation is part of your dinner plan. It’s as loud as a restaurant gets, requiring guests to shout to companions sitting inches away. An industrial look with wood, steel, and concrete surfaces guarantee a noisy experience. Still there’s charm to be found in painted wall murals by Yescka, a renowned Oaxacan street artist. It’s worth a stroll around the restaurant to take it all in. 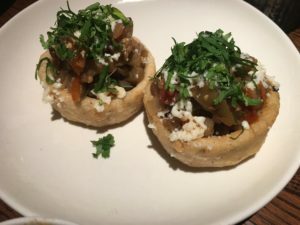 Espita Mezcaleria is fun and original, with food that elicits a “holy mole.” It’s a restaurant that transports you and provides an authentic taste of Oaxaca, Mexico. That said, to fully enjoy it you may want to consider transporting yourself home by some means that doesn’t require you to get behind the wheel. Tail Up Goat: Thumbs Up!